On the 1st (Sat), admire the sheer force of Horizontal Falls. For traveler tips, photos, where to stay, and more tourist information, you can read our Talbot Bay trip planner . Melbourne to Talbot Bay is an approximately 17-hour flight. You can also drive. Traveling from Melbourne to Talbot Bay, you'll gain 2 hours due to the time zone difference. On the 1st (Sat), wrap the sightseeing up by early afternoon so you can travel to Purnululu National Park. Kick off your visit on the 2nd (Sun): explore the striking landscape at Purnululu National Park and then explore the striking landscape at Bungle Bungle Range. 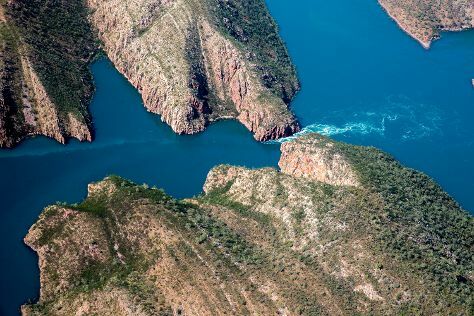 To see ratings, maps, photos, and more tourist information, refer to the Purnululu National Park trip itinerary planner. The Route module can help you plan travel from Talbot Bay to Purnululu National Park. Wrap up your sightseeing on the 2nd (Sun) to allow time to travel to Broome. Satisfy your inner culture vulture at Broome Historical Museum and Catholic Diocese of Broome. Relax by the water at Cable Beach and Roebuck Bay. Spend the 3rd (Mon) wandering through the wild on a nature and wildlife tour. There's lots more to do: get up close to creatures of the deep with a dolphin and whale watching tour, look for all kinds of wild species at Malcolm Douglas Crocodile Park and Animal Refuge, stroll the grounds of Japanese Cemetery, and enjoy the sand and surf at Broome Town Beach. To see photos, ratings, reviews, and tourist information, go to the Broome trip builder . You can drive from Purnululu National Park to Broome in 11.5 hours. In June in Broome, expect temperatures between 35°C during the day and 19°C at night. Wrap up your sightseeing on the 7th (Fri) early enough to travel back home.